Right Toothbrush - What considerations you choose and buy a toothbrush? It may be a simple problem, but many ignore it. Most people buy a toothbrush with considerations affected the price or advertising. No one did. However, the selection of the wrong brush can cause a variety of complaints. You can use the following tips as a guide in buying a toothbrush. 1. Choose a soft bristle brush. Coarse bristles can damage the gums, making teeth more sensitive to food or drink cold or hot. 2. When looking to buy a toothbrush lid, make sure the lid has air ventilation. If not, be covered with bacteria toothbrushes because moist. 3. Customize size toothbrush with oral cavity so that you can rub the hard part affordable. 4. Suggest choosing a toothbrush handle is wide enough so that you are more comfortable when held. 5. 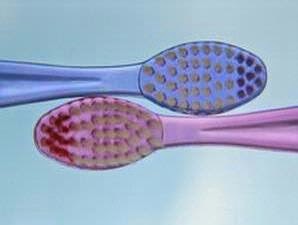 Choose an oval-shaped brush heads can protect gums because of the possibility of getting hurt. 6. If you want to buy an electric toothbrush, you know, excess toothbrush is just rubbing faster. Better to use a conventional toothbrush alone, unless you need to brush your teeth flash. 7. Replace your toothbrush every three months or when the bristles already feel uncomfortable so as not to injure the gums.